Updated Monday December 3, 2018 by Vicki Comerford. Please join us in supporting our Colts Cheerleaders and Dancers as they were invited to participate in the GCHS Cheer and Dance Showcase on Wednesday night, Dec. 5th, beginning at 7:00pm. Entrance and parking are free, and everyone is welcome. Come out and show the cheer and dance teams your support! Our cheer and dance state competitions through IRCA also begin on Friday night, Dec. 7th, at the Sears Centre in Hoffman Estates. 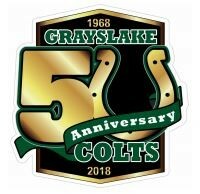 Please visit the following website for the order of performances: http://www.recreationalcheer.com/index.php?componentName=Section&scid=54922 Our teams would very much like to see the crowd wearing as much green and black as possible - showing their support of Grayslake Colts! Good Luck, Cheer and Dance teams!